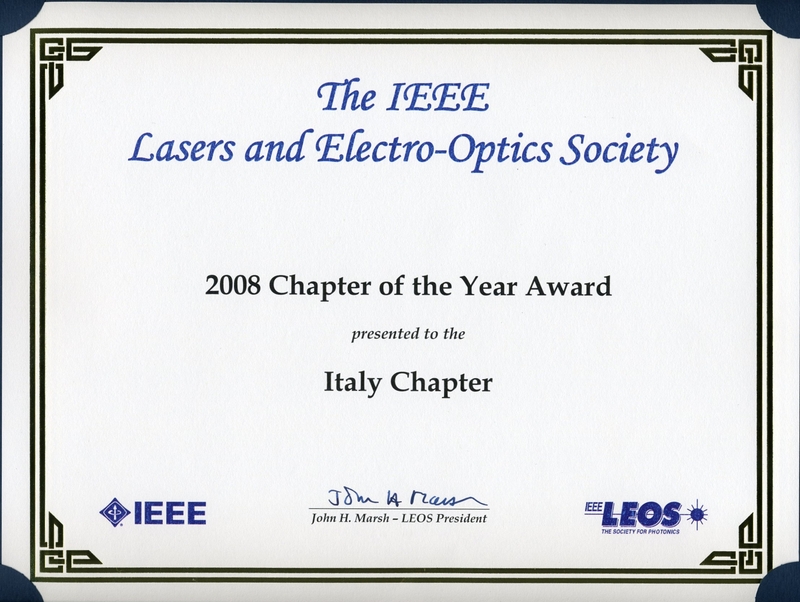 The IEEE Photonics Italy Chapter was founded in 1997, with the name of LEOS Italian Chapter, by the first Chairman Silvano Donati. It started its activity on April 1st. The work of the Chapter was awarded several times. In 1998 and 1999 with the LEOS Most Improved Chapter Award, in 2001 with the LEOS Chapter of the Year Award, in 2002 with the LEOS Most Innovative Chapter Award and the Chapter of the Year of IEEE Region 8, in 2007 with the Chapter of the Year of IEEE Region 8, in 2008 with LEOS Chapter of the Year Award and in 2010 with Photonics Society Most Improved Chapter Award. Each year, the Chapter program is shaped by the Officers, approved by the Chapter Executive Committee. Presently, the CEC is formed by 17 members from universities, research centers and industries of North, Center and South of Italy. The updated list of Chapter Officers and CEC members is available on this web (Chapter Board). The IEEE Photonics Italy Chapter activity includes: National and International Lecturers; Workshops and Conferences; awards and prizes. Past and future program of the Chapter is available on this web. Promote student membership with prizes and awards and supporting the activity of Student Branches. 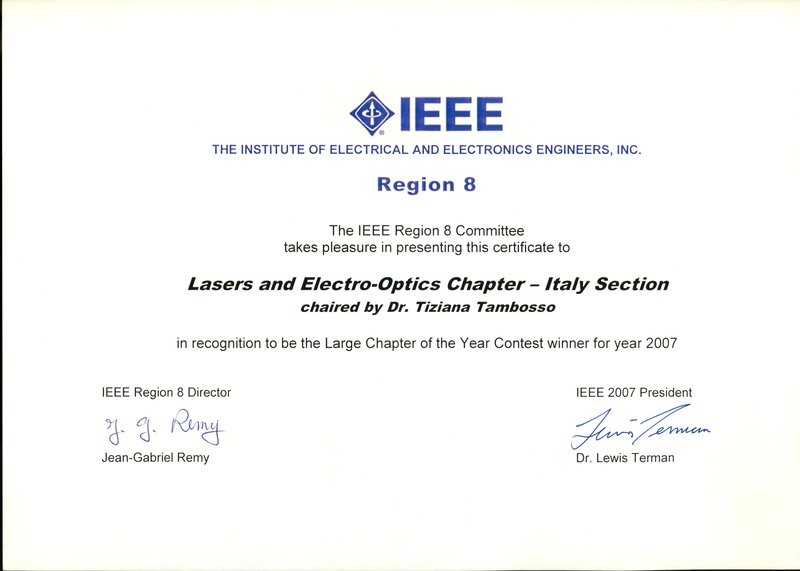 2007: IEEE Region 8 "Chapter of the Year 2007"
2002: IEEE Region 8 "Chapter of the Year 2002"
© Copyright 2007 PHOS Italian Chapter – All Rights Reserved.